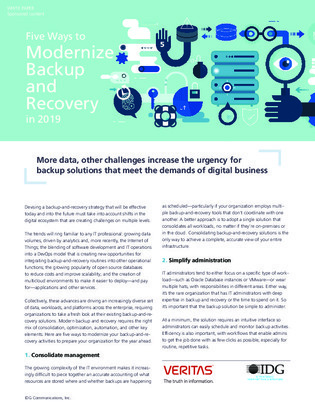 Devising a backup-and-recovery strategy that will be effective today and into the future must take into account shifts in the digital ecosystem that are creating challenges on multiple levels. Modern backup and recovery requires the right mix of consolidation, optimization, automation and other key elements. Here are five ways to modernize your backup-and-recovery activities to prepare your organization for the year ahead.